There’s nothing like getting up & singing and dancing! Seek the joy! It’s one of the guiding principles of the elementary school I helped to found in the summer of 2015. It’s the core principle of my music classroom. Recently, at a pre-holiday gathering, our school staff all wrote shout-outs to each other. I saw “joy” repeatedly in the comments for me, so I know I’m doing the right thing! 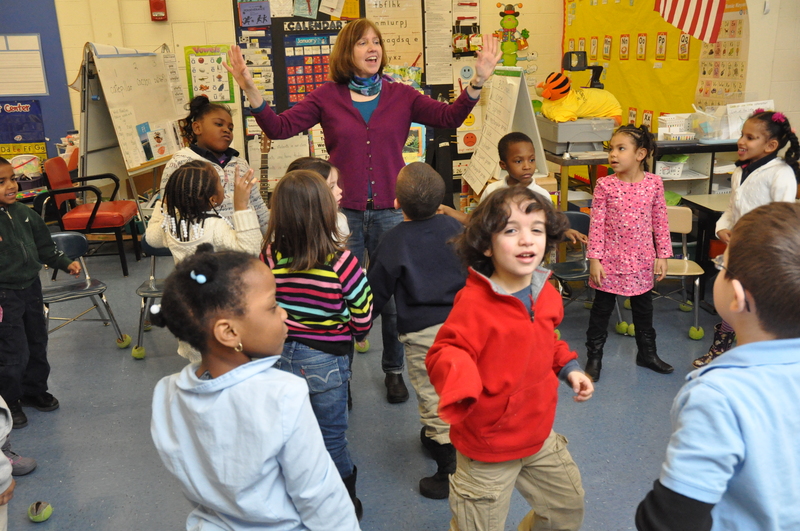 Sometimes when I get muddled up in thinking about curriculum and benchmarks and those academic-sounding terms that govern our lives in education, I shake it off by returning to singing, dancing, and storytelling. I summon the joy. Joy is when I get out as many instruments as possible and let as many people as possible play them. Joy is watching the mouths of our students fall open when I bring my friend who plays double-bass to the school and they think it’s a giant violin. Joy is dancing just to the edge of losing control (and sometimes a little beyond it). Joy is kids throwing colorful scarves in the air and catching them on various body parts (or not). 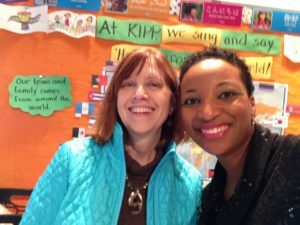 Joy is when I bring my fellow children’s singers to the school – one African American and one Latino – and so many children (and teachers) are thrilled to see musicians who look and talk like them. “Culture Queen” Jessica Smith visited my school in the spring of 2016, bringing joy and cultural understanding. Joy is telling simple stories and having the kids play instruments for all the characters. Joy is seeing the kids take over the glockenspiels during play time and use the simple notes that I created to play the songs over and over again. Joy is the excitement of getting a new xylophone! Purchased on a whim on cyber Monday, it still wasn’t cheap, but it looks and sounds so beautiful. Joy is when I hear a first-grade boy sing solo on “This Land is Your Land.” His skin is brown, and it IS his land. His teacher has tears in her eyes. Whatever else you resolve to do in the New Year, resolve to seek the joy. And find it! 5 Responses to Seek & Find the Joy in Music! Wonderful message, Liz!! “Seek the joy” is right living! It’s very close in spirit to my mantra of “All things are possible!” I love that you are living what you believe in! Happy New Year! I hope you are filled with a joy today! Can you share an example of a story you tell and then retell with the children playing instruments for the ccharacters. Thank you for sharing such special moments. Here’s a link to continue your inspiration – Joy Shall Come in the Morning.